But the men that went up with him said, We be not able to go up against the people; for they are stronger than we. And they brought up an evil report of the land which they had searched unto the children of Israel, saying, The land, through which we have gone to search it, is a land that eateth up the inhabitants thereof; and all the people that we saw in it are men of a great stature. 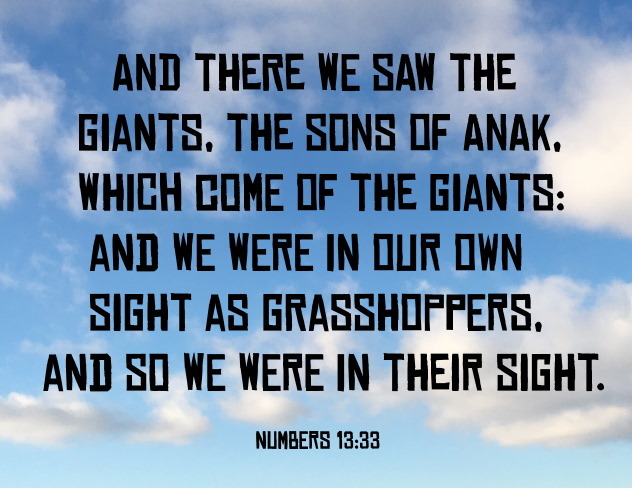 And there we saw the giants, the sons of Anak, which come of the giants: and we were in our own sight as grasshoppers, and so we were in their sight (Numbers 13:31-33). And the Lord said unto Moses, How long will this people provoke me? and how long will it be ere they believe me, for all the signs which I have shewed among them? I will smite them with the pestilence, and disinherit them, and will make of thee a greater nation and mightier than they (Numbers 14:11-12). Pardon, I beseech thee, the iniquity of this people according unto the greatness of thy mercy, and as thou hast forgiven this people, from Egypt even until now. And the Lord said, I have pardoned according to thy word (Numbers 14:19-20). God's people complained or murmured five times prior to this "grasshopper mentality" instance - Exodus 5:1-22, Exodus 14:11-12, Exodus 15:22, Exodus 16:1-4 and Exodus 17:1-4 - without being disciplined for their rebellious ways. They then disobeyed His direction three times before this event - Exodus 32:28, Numbers 11:1-35 and Numbers 12:1-12 - where God took severe action against them. We would think that they would have learned to obey Him by the time of this incident. But, as we just read above, they had not - they had continued to be disobedient. Grasshopper Mentality - I don't need to do this! Throughout the pages of LovingGospel.com, I talk about being obedient to the Gospel of Jesus Christ. If you are reading this page now and have not repented, not been baptized in Jesus' name for the remission of your sins and have not been filled with the Holy Ghost with the evidence of speaking in tongues, you must ask yourself, why not? Jesus answered and said unto him, Verily, verily, I say unto thee, Except a man be born again, he cannot see the kingdom of God. Nicodemus saith unto him, How can a man be born when he is old? can he enter the second time into his mother's womb, and be born? Jesus answered, Verily, verily, I say unto thee, Except a man be born of water and of the Spirit, he cannot enter into the kingdom of God (John 3:3-5). If you are saying to yourself, "I don't need to do this" to be saved, this grasshopper mentality is dragging you down the wrong path, just like it did me when I was about nine years old. I had been told I had been saved when I said the sinner's prayer. I wandered in the dessert of this world for forty-four years until Jesus found me and I obeyed the Gospel of Jesus Christ at the age of fifty-three. Tragic things happened in my life during those forty-for lost years. I could have easily died during that period of time and have been lost for eternity. Don't be fooled by anybody that tells you that you do not need to obey Acts 2:38. They do this as it comforts them as they continue to live in sin. Without having been filled with the Holy Ghost, it is impossible to live a life without sin. Why would you want to try? I beseech you to turn your life completely over to God and live in His favor, blessings, grace and mercy. Click on the button below for more study on getting to heaven.